Ace Of Pentacles: “It is the possibility of prosperity, abundance, and security. It is the promise of wealth and well being, of flourishing and reaping the rewards of hard work. Energy spent will see returns. A seed has been dropped into the fertile earth. What will sprout from that seed? What strange flora will burst forth? 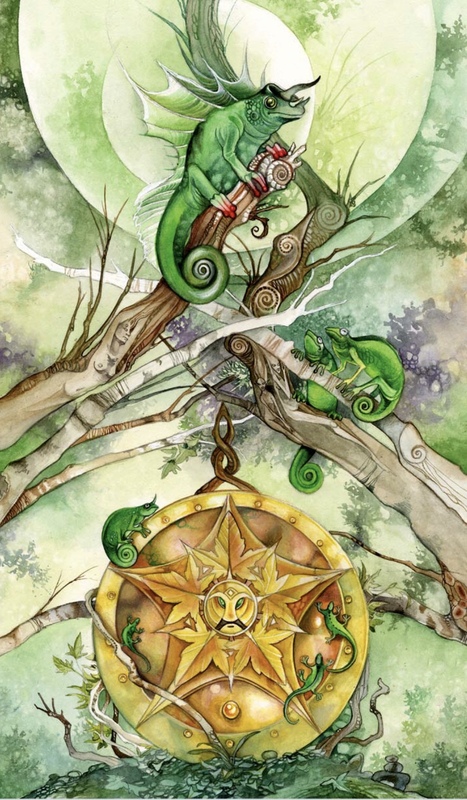 The suit of pentacles is a promise that something will come, but it will require patience and work. What grows is what you make of it. The seed must be watered and nurtured, for nothing grows in a void, and success requires more than dreams and fantasies. Water with desire, and nurture with faith and effort and diligence. And here we step into another fresh start. A clean slate, ready to be brought to life with our hopes, dreams, hard work and dedication. What will we create? This is a very auspicious message to start the year with; a reminder of the abundance and prosperity available to us all. Look at how far we have come in our journey. Look at how bright the future could be, if we choose to create it as so. It is all up to us. The predominance of green and gold speaks of the heart center and solar plexus; the meeting of the heart and the will to create the fertility of abundance. Receptivity, authenticity and integrity meets self-confidence, will, courage and personal power. Together these potent forces make for a focused, expansive and successful future. What seeds will you plant as we step into this new beginning? What will you choose to create and how can you do it with passion, joy, self-belief and an expanded awareness of what is really possible for you? Get really clear and set an intention for this year. Take some time alone to dream through it in as much detail as possible. Pull it towards you by putting your heart and soul into it’s visualization, seeing it, feeling it, sensing it, experiencing it before it comes to pass. Knowing that it will come to pass.